NYC, 02/06/2019, 7:30PM. What’s Left of the Dream Team? : Race, Gender, and Activism in U.S. Athletics. Throughout history, black and brown athletes from the U.S. have used their intersectional identities in sports to bring awareness and shed light on the human condition. Often times, these outspoken athletes are asked to “shut up” and do what they are paid to do. These same black and brown bodies dream of bringing gold medals, national championships, and accolades for their teams and selves; but, at what cost? Is the dream to find possible success in sports worth the damage it causes? Can athletes be more than athletes - but activists to things that matter to them? 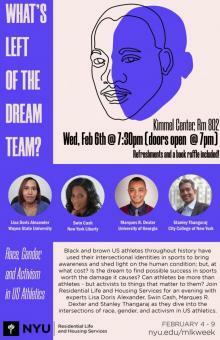 This is an evening with experts Lisa Doris Alexander, Marques R. Dexter, Stanley Thangaraj, and Swin Cash, who will dive into why the intersections of race, gender, and activism in US athletics is important to the Dream that MLK once spoke.